So my test results came back and I didn’t do so good. The diagnosis made Mom and Dad real sad. But Mom told me to start thinking about all the things I want to do so we can do them once the doc says I can play again. And since I am on an unrestricted diet, Mom said to tell her all the things I want to eat. So of course, the first thing on my list was pizza! And not just any pizza – a bacon pizza ! Awww sweetie, M isn't very happy at your news either. But I'm estatic that you got what you wanted. I'm purring for you pal. This gives my mommy the leaky eyes :( Paws crossed for you and your family. So sorry you didn't get good news. Glad to see you're having some pizza. 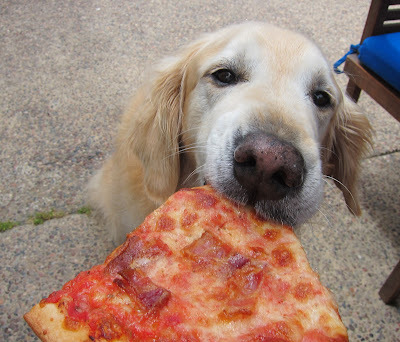 I'm sure you'll have lots more slices of bacon pizza and other treats to enjoy. Oh Bear.... I am so sad to read this. I pray for many happy days full of yummy pizza and all the fun things you can fit into every day. Love you sweet Bear!! you have brought many smiles to me over the years and I hope you get to bring me many more as I watch you enjoy! My best wishes to you my dear friend. As the saying goes, sieze the day! I am so sorry this is happening. I may not always comment but I LOVE your blog. You have been doing your mission of making people smile. I hope you get lots of fun, snuggly, sunshiny days coming up. We are so sorry to heat this, Bear! We are sending everyone lots of hugs, kisses, prayers and positive thoughts!!! Darling Bear, so sorry to hear your news. You are so loved. Sending you and your family lots of love and prayers. Oh Bear. I'm so sorry the test results were bad. Love to you and the whole family. Bear, I'm so sorry for the not so good news. I'm purring real hard for you and your family, my human and I love you and your blog so this makes us really sad. No, No, No bucket list. No. Nope. Yes to Pizza. But no bucket list. Please. I cried and so did my mom. We love reading your blog every day. You deserve lots of pizzas and smiles. All of us rescued pets will hold paws and form a circle of love to embrace you, your mom and dad...so you know how much we all care! Oh Bear, it's been 24 hours since we last heard from you. How are you feeling today? Oh Bear, Mama and I are so sad to read that you got bad news. We can't imagine anything bad happening to you, and we would miss you so very much! I'll be purring with my sisters and Mom will be praying that things stay the best they can for a long time. I'm so happy u get to eat all the pizza you want tho! Lots of hugs and snuggles from Mom and Dad and beach time and pizza. We love you Bear! so sad to read this Bear. I read your blog daily and it is my home page at work. Your blog always make me smile. Oh Bear - I hope you defy whatever odds they gave you. Keep calm and pizza on! Now I'm really sad, Bear. 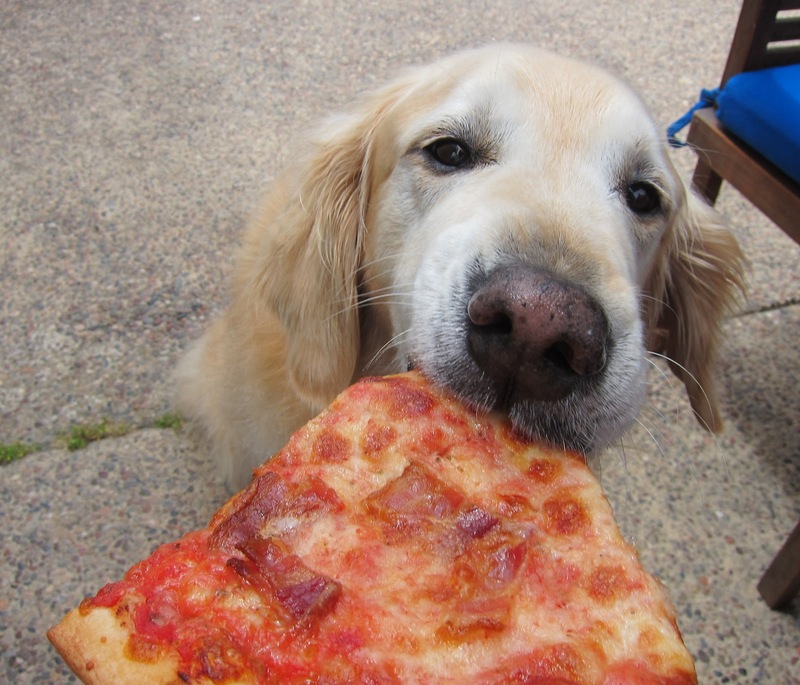 I'm slogging through all those posts I've missed and I think you should get all the pizza you can. I even had some in your honor. A big feathery hug to you, dear, sweet Bear. I love you, your posts, and your photos. Bear this is crap, just crap !! The #HandsomeManClub cannot survive without you, chicks really dig ya. I will stand at the window everyday starting right NOW and hold my paw up to the West and send you all the #healing energy from the whole DOG WORLD to you. It will work, I have super dog powers so be ready for a zap of GET WELL NOW !